This week on Monday evening, some Muslims ending their fast in Dubai got a surprise: an iftar meal from the local Sikh Gurdwara. Members of the Al Manar Islamic Centre had their iftar meal provided by the Guru Nanak Darbar – the biggest Gurdwara in the Gulf region. Afterwards, scholars from both religions held a discussion on the values they shared. The meal was vegetarian of course. This is the second year in a row the huge Gurdwara in Dubai has hosted an iftar dinner for Muslims. They plan to make it an annual event. The Guru Nanak Darbar Gurdwara in Dubai opened in 2010 at a cost of $20 million; the land was donated for free by the Emir of Dubai. 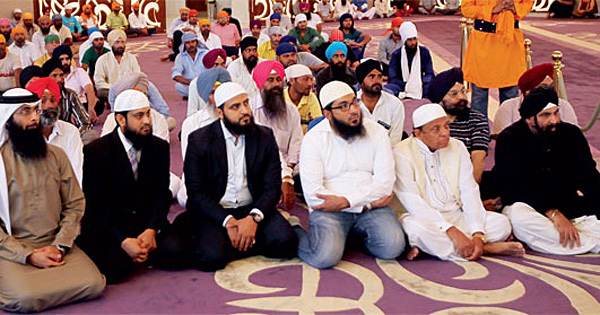 There are around 10,000 Sikhs in Dubai and are estimated to number around 250,000 in the entire region. Unlike other places, the Gurdwara is allowed to serve langar the whole day even during the holy month of Ramadan.